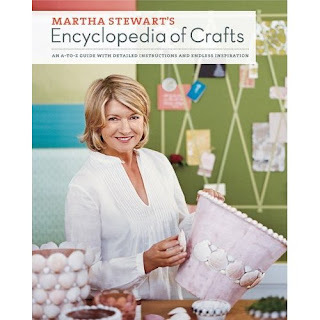 I bought the Martha Stewart Encyclopedia of Crafts last summer. I have been looking at the different crafts for a few months, without having actually attempted one. Things that have looked interesting: beaded flowers, sand candles, decoupage anything, fabric flowers, and lots more. 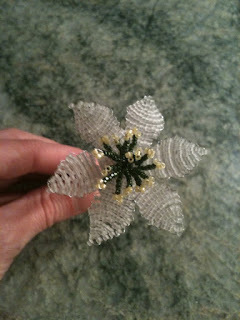 Well this past weekend I finally got my act together and started work on a beaded flower - the small camellia. Here it is mid assembly. Here is a photo of the finished product. Pretty good right? I wanted to try making one because I am thinking about tucking a few into my bouquet. This small flower probably took about 2 hours to make and assemble. It was easy to pass the time though because I was watching "You've Got Mail" at the same time on tv. 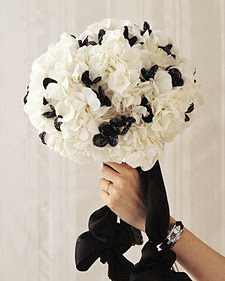 This is an inspirational bouquet from Martha Stewart Weddings where black beaded flowers have been tucked in among the fresh flowers. 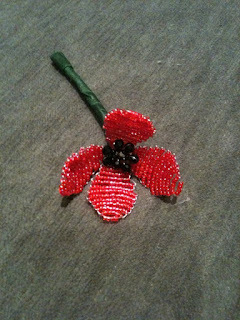 I should mention that I wasn't the only person to create beaded flowers last weekend! Audrey made this adorable dogwood flower (and a couple of others not pictured). Very cute! [update]: Audrey completed a daffodil! Very pretty - made with clear matte beads.